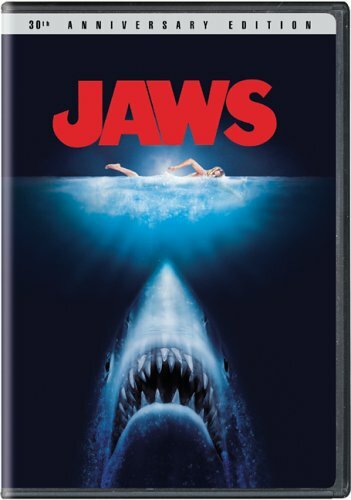 Jaws (30th Anniversary Edition) - BUY THIS DVD! From the best-selling novel by Peter Benchley, Steven Spielberg directed this thrill ride of terror. During the height of beach season, the Massachusetts resort town of Amity Island is terrorized one summer by surprise attacks from a great white shark. Three unlikely partners team up to hunt down the rogue and destroy it: the new chief of police from New York (Roy Scheider), a young university-educated oceanographer (Richard Dreyfuss), and a crusty old-time fisherman (Robert Shaw). The film shoot was notoriously difficult for the young Spielberg, who had directed only one feature film before JAWS. The mechanical shark seldom operated correctly, and Spielberg was frequently forced to create the idea of terror without actually showing the shark. However, after the film premiered it went on to become the highest-grossing film of all time--surpassing THE GODFATHER and becoming the first film to gross more than a hundred million dollars. Composer John Williams created the score to JAWS, which has since become a well-known theme of impending doom. Ron and Valerie Taylor were responsible for filming live sharks in Australia; their sequences were later mixed with footage of the mechanical shark. HOW TO WIN? SIMPLE. SEND IN YOUR NAME AND ADDRESS TO contests@efilmcritic.com. Put "BEST MAKING-OF DOCUMENTARY EVER!" in the subject line and cross your fingers. We will draw names and one of the DVDs from Universal will be yours. Only 1 entry per household.